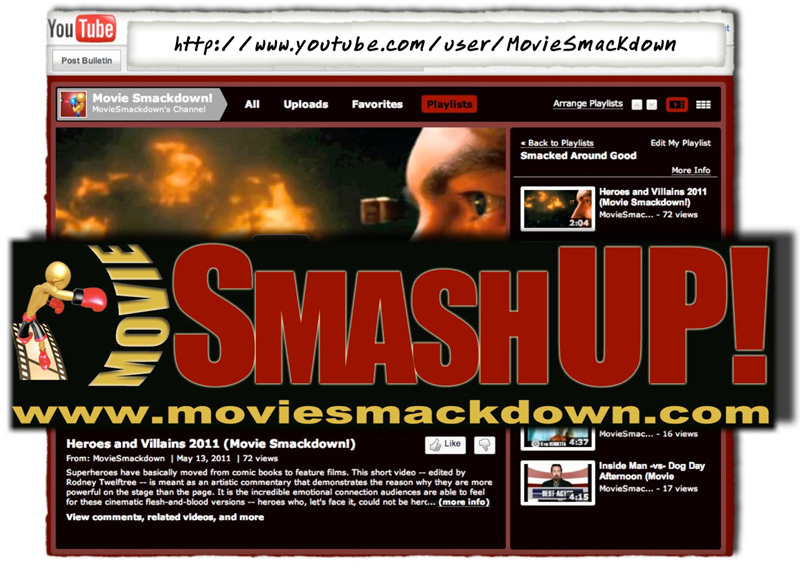 Movie SmackDown! presents Movie SmashUps! The Smack and the Smash! Two movie trailers for the price of one. Smashups are our new video passion created to amuse ourselves and justify the costs of all those iMacs in our sprawling corporate headquarters in Los Angeles. Since the early days of film, studios have created previews for movies. These were originally shown at the end of movies (hence the term “trailer”). These previews were often little more than a list of which actors and actresses were staring in the film, interspersed with cuts of the film. Sometimes they even had the stars talking about the picture. Then, the movie studios evolved the movie trailer into an art form, something that was of a movie but existed separate from the rules of film. It brought hype to a new level. Sometimes they told the movie’s story in such detail you didn’t need to go see it. Other times they showed you a movie that the producers had only wished they’d made. And, sometimes, they were completely inspirational and transcendent. Then came something that was inevitable in a world of YouTube, promotional video, fair use protection and Apple computers: the mashup between several trailers for the purpose of creating something that made an artistic statement about the source materials it was incorporating. We call these trailer mixes Movie Smashups! Most of our Smashes make the artistic statement that the two movies we’re drawing from both share similarities — the fuel for our reviews at Movie Smackdown! — and that comparing them reveals strengths and weaknesses in each that would not normally be recognized when reviewing a single film. We want to highlight the work of Edd Hall in this process. He’s one of the premier voice artists working in television today, a man who served as announcer on The Tonight Show with Jay Leno for 12 years (“… and me, I’m Edd Hall”). Every night he introduced the show and traded quips and barbs with Jay, often appearing in the show’s sketches as Jay’s comic foil. Edd is a key member of our Smackdown artist’s collective, all of us joining forces to try to create something new and exciting in the way people talk about movies. Check him out here in one of our favorite new Smashups! Someone else who is bringing a lot of game to the Smashup! side of the Smack is our good friend from Australia Rodney Twelftree. Rodney’s work illustrates how superheroes have basically moved from comic books to feature films. His first short video for us, Heroes and Villains, demonstrates the reason why these super-humans are more powerful on the stage than the page. It is the incredible emotional connection audiences are able to feel for these cinematic flesh-and-blood versions — heroes who, let’s face it, could not be heroes if they didn’t have villains to fight. We just have to single out the song that is used in Heroes and Villains. It is “Sons of War” by Two Steps from Hell. Buy their music. This cut is obviously awesome. Buy them. Finally, just because it’s fun, we have to mention that our first Smashup! ever just keeps making us smile and getting views over at YouTube. We mean these Movie Smashups! as artistic statements protected by the legal concept of “fair use.” And based on what we see is on the Internet, it seems like we’ve played by the rules. So, to the studios, please consider this promotional for your products, a generic ad, if you will. Thank you. We mean that sincerely.